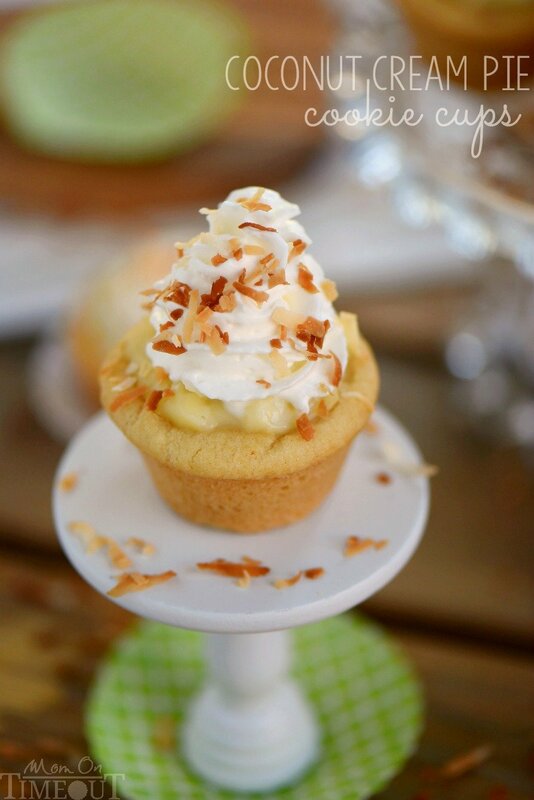 Coconut Cream Pie Cookie Cups! 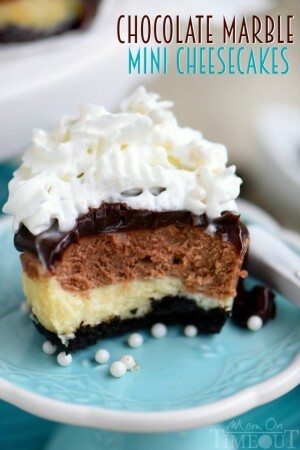 Two of my favorite desserts collide in this easy to make recipe that will have your guests oohing and aahing in no time! 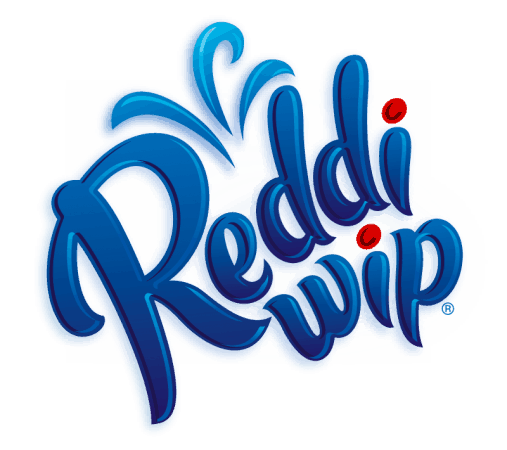 This post is sponsored by Reddi-wip. I’m a sucker for two desserts in one. Always have been. If I can get more, I want more. Done. I love desserts like these lemon meringue cookie cups and this brownie sundae pie because they take dessert to a whole other level…the level where we all have to loosen our pants a bit…but it’s totally worth it. 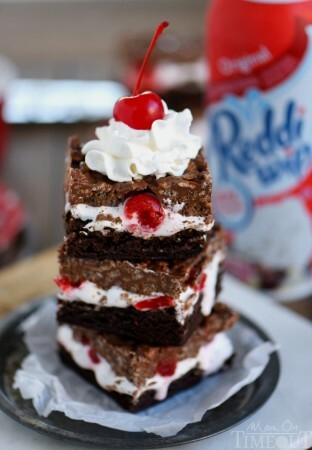 What I like even more is when I can combine two desserts into one…and then top it with a swoosh of Reddi-wip…HEAVEN! 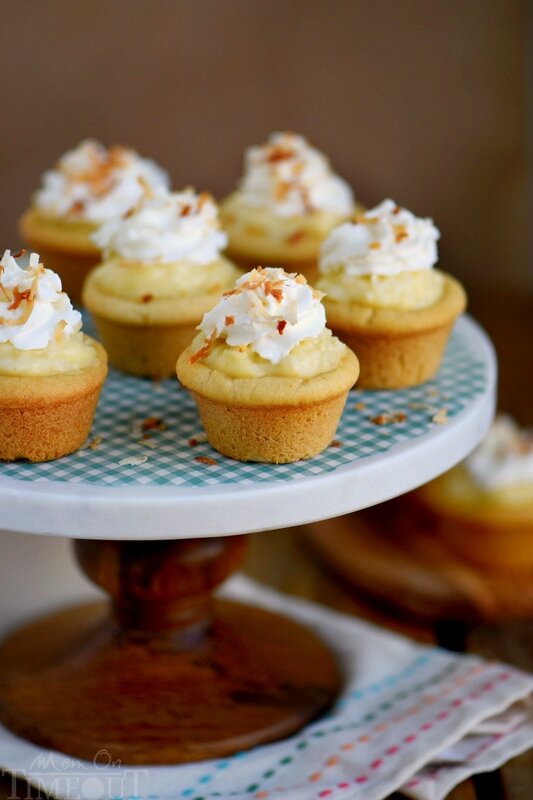 Today I’m bringing you a two-for-one dessert that my Dad completely approves of – Coconut Cream Pie Cookie Cups. Now, there is absolutely not one thing wrong with my Dad’s Coconut Cream Pie, I mean, it’s like the best thing in the world. Buuuut, did you know that swapping out that pie crust for a sugar cookie cup could take that amazing pie to something other-worldly? Yep. It can. You may have noticed that these cookie cups are topped with a swoosh of Reddi-wip – it’s my favorite way to top most desserts. It adds a little something extra special and makes people happy. You’ve seen me share five amazing recipes featuring Reddi-wip over the past six months and today I’d love to reminisce a little about the #SharetheJoy mission I’ve been on. You may recall these Candy Corn Poppers. A bright pop of color that is irresistible to kids and adults alike. Sure, these are great for fall but change up the colors (red, white, and blue) for a totally new and awesome treat. Just don’t forget to top with Reddi-wip! 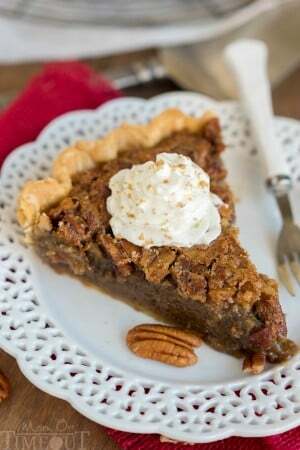 As we approached the holidays, I shared this Brown Butter Brown Sugar Pecan Pie. Not only is this pie a favorite during the holidays, but since it features my family’s favorite nut, it’s a welcome addition to any party all year long. This recipe is so easy – I like to make TWO! One for me and to share with a friend. It’s so easy to share joy with others and pie is a sure-fire way to bring a smile to anyone’s face. Next, one of my favorite recipes of the year – Chocolate Marble Mini Cheesecakes! If you’re looking for a show stopper recipe, look no further. The boys and I had such a fun time delivering a tray of these beautiful treats to a friend. We brought a can of Reddi-wip over so they could top their own cheesecakes with a little goodness. As our journey of sharing and spreading joy continued, these Cherry Brownie Dream Bars were next on the list. The boys took some to school to give to friends and Chris took a tray to work as well. The idea behind giving these bars is simple…we share some treats with you…and you share them with someone else. These bars are so easy to make and are so perfectly decadent! 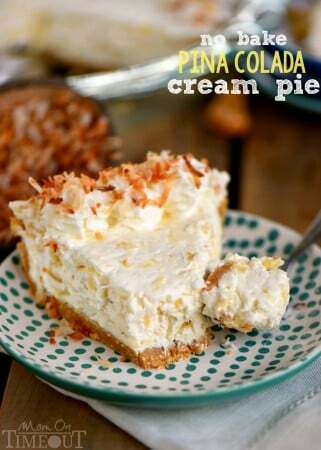 Last month I shared this amazing No Bake Pina Colada Cream Pie. It’s no bake which is perfect for summer and it so creamy it just melts in your mouth. I took some time to stop and enjoy some pie with a friend and found completly peace and joy in the simple act. We are all so busy that it’s the simple things that really make a difference. I hope that you have seen how simple and easy it is to share joy with others. I want you to be inspired to continue Reddi-wip’s mission to #ShareTheJoy in your community and take a moment (or two!) each and every day to experience all the joy that surrounds you. And remember…everything is better with a whoosh of Reddi-wip! Coat a mini muffin tin with nonstick cooking spray. In a large bowl, combine cookie dough and all purpose flour. Knead together until well blended. Shape dough into one inch balls. Press cookie dough in bottom and up the sides of each muffin cup, forming cup shape. Bake 10 to 12 minutes or until edges are just starting to turn golden brown. Remove from oven and let cool for at least ten minutes before gently twisting to remove from pan. Place on rack and let cool completely. Combine coconut milk, half and half, eggs, sugar, corn starch and salt in a large, microwave safe bowl. (I use my large Pyrex measuring cup.) Stir. Microwave on high for one minute, stir. Repeat until a thick custard has developed. 5-7 minutes. Stir in 1½ cups coconut and coconut extract. 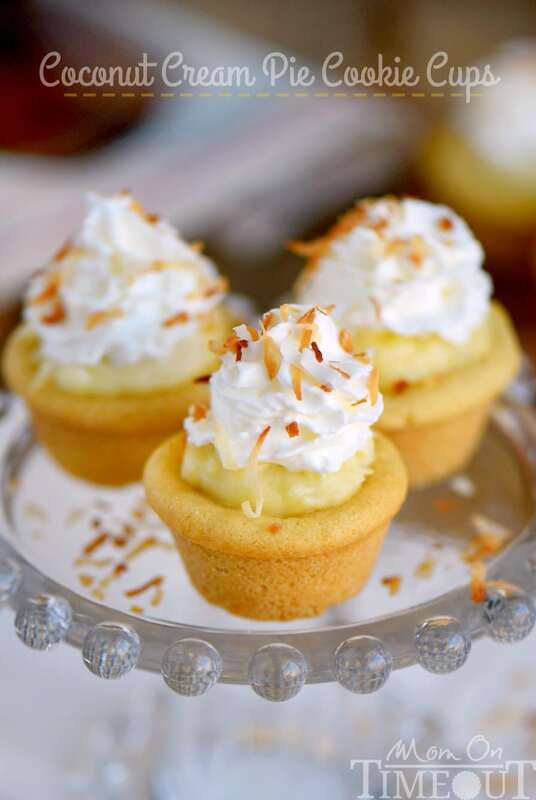 Spoon coconut custard into cooled cookie cups. 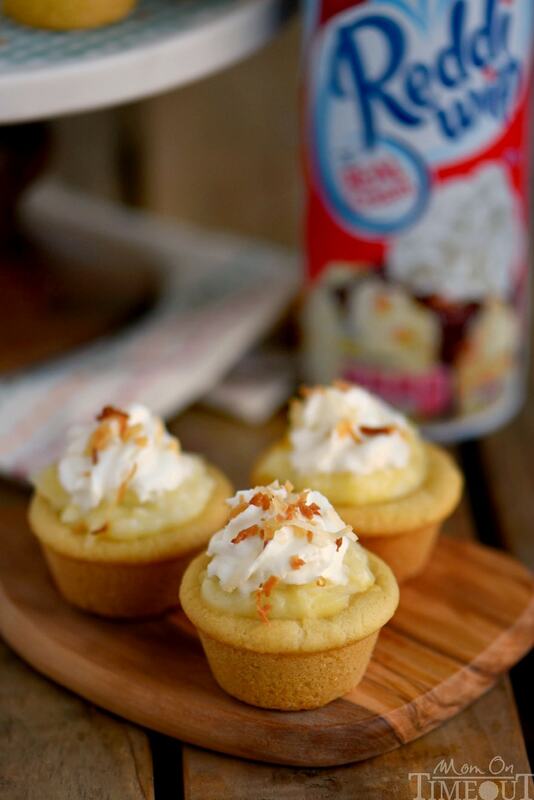 Top with Reddi-wip and toasted coconut. Where would I find the recipe for these? Hi Denise! The recipe is right there in the post, towards the end. Hope that helps! Wow these look sensational. I wish I could have a couple of them for my treat of the day! These are so adorable! Perfect summer time party food! These look so divine! I am a HUGE coconut cream pie fan — so I must make this asap! I’m so in love with these little cups! Such a no-brainer (obviously delicious)!!!! These are so cute! 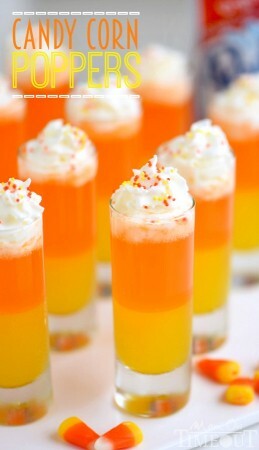 Perfect for a summer party! 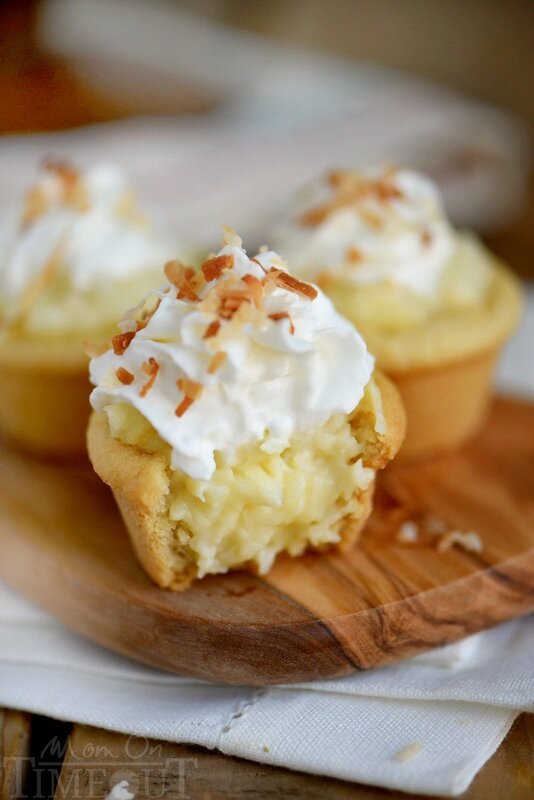 These little coconut cream pies are adorable, and cookie cups just rock in general. And I love your Reddi Whip roundup! It does come in super handy, and it’s delicious, so there you go! What a perfectly delicious little bite!